Lithographs, pair, signed and numbered, limited edition. Framed, mahogany, double mat with filet. 38" x 30", overall frame size. 27.5 x 19.5, sights size. Kenneth Reed, FRSA lives in the North East of England, and has specialised in watercolours of famous golf courses since 1984. Over the past three decades Reed's talent has established him as the world's leading painter of golf course landscapes, capturing both the beauty and the challenge of golf. From Turnberry to Pebble Beach, Reed's distinctive watercoulours are as evocative as they are accurate. Ken Reed is recognised as one of the "living art treasures" of the UK, and is designated with the honor "Fellow" of the Royal Society of Arts in England. Reed is official artist of the United States Golf Association (USGA) and the official artist of the Royal and St. Andrews, Scotland. Reed's connection with the R & A makes it especially appropriate that one of our images is a view of the 18th Hole at St. Andrews, with the iconic stone Swilcan Bridge in the foreground, and the Clubhouse in the distance. 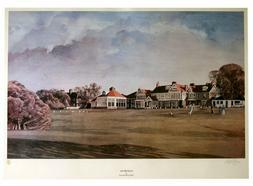 It was here that the game of golf originated nearly 600 years ago. Our other image is of the Clubhouse at Muirfield, where the first ever official rules of golf were established in 1744, and where 15 British Open tournaments have been played. Our framed lithographs are excellent examples of Reed's talent. 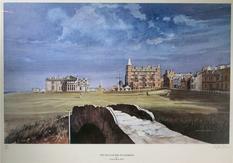 Each item is artist signed and numbered: St. Andrews is 168/850, and Muirfield is 297/850.